Preble Shawnee’s Logan Hollon gets fouled as she attempts a shot during the Arrows game with Northridge on Saturday, Feb. 2. 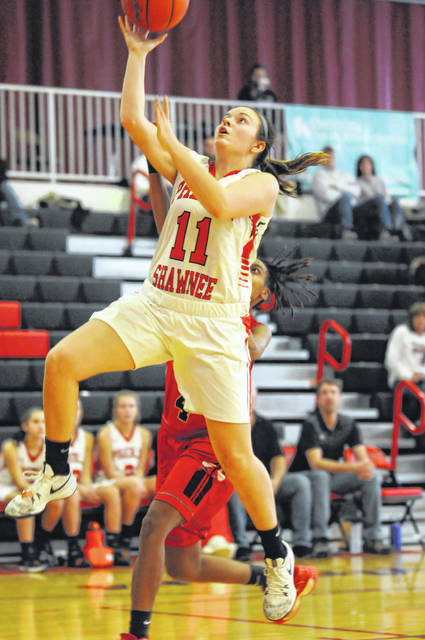 Hollon scored seven points to help Shawnee to a 68-25 win. 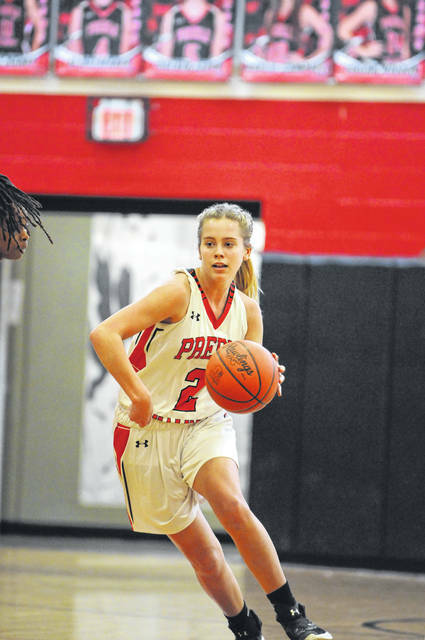 CAMDEN — Preble Shawnee’s girls’ basketball team began a stretch of six games in 10 days with a 68-25 win over visiting Northridge on Saturday, Feb. 2. The Arrows (12-5, 9-1 SWBL Buckeye) are scheduled to play four more games this week and another next Monday. 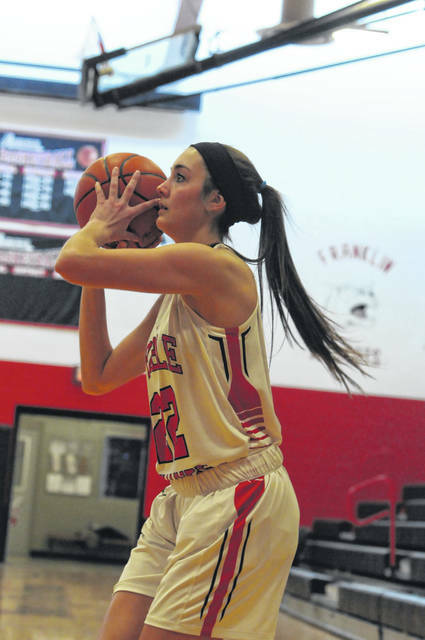 They were scheduled to host Fenwick on Monday and play Waynesville on Tuesday for a shot at least a share of the Southwestern Buckeye League Buckeye Division title. The Arrows will then play at Eaton on Thursday and will close out the week with a home game against National Trail on Saturday evening. They will close out the regular season with a trip to Milton-Union on Monday, Feb. 11. The win over Northridge was the Arrows sixth straight. Shawnee jumped out to a 12-1 lead in the first four minutes and was never really threatened. Although the Polar Bears hung around and kept the game interesting the remainder of the first half. The Arrows led 20-6 after one and was up 30-18 at the half. In the second half, Shawnee opened with a 10-0 run and outscored Northridge 12-2 in the quarter to take a 42-20 lead into the fourth quarter. Shawnee used two big scoring runs in the final quarter to claim the easy win. The Arrows scored the first 13 points of the quarter to take a 55-20 lead. After a Northridge basket, Shawnee rattled off the next 11 points for a 66-22 lead. During the final eight minutes, the Arrows made 12-of-15 shots attempts. Brenna Woodard had 16 points, seven rebounds, four steals and three assists. Jenna Lovely tallied 16 points with five rebounds, four steals and a pair of assists. Nicole Sims contributed 11 points with three rebounds and three assists. Logan Hollon added seven points and seven rebounds. 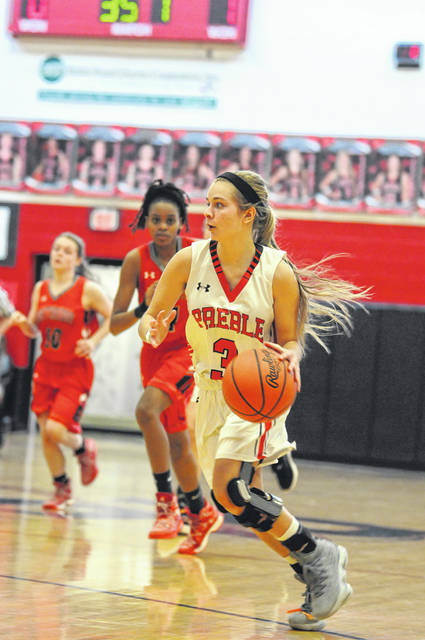 Kaylie Campbell chipped in with four points and had six rebounds and three assists. Jasmine King came off the bench to score eight points. 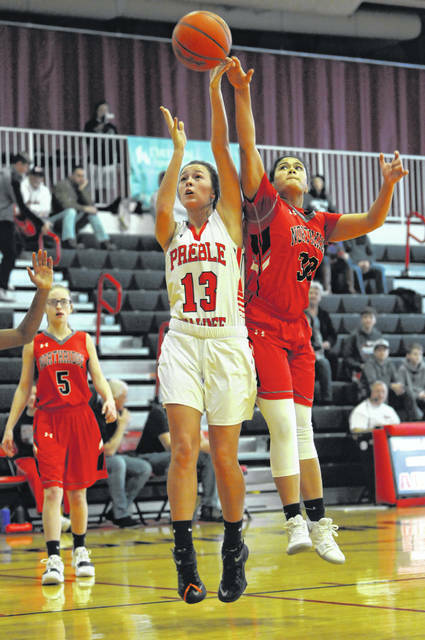 https://www.registerherald.com/wp-content/uploads/sites/41/2019/02/web1_psgbk2.jpgPreble Shawnee’s Logan Hollon gets fouled as she attempts a shot during the Arrows game with Northridge on Saturday, Feb. 2. 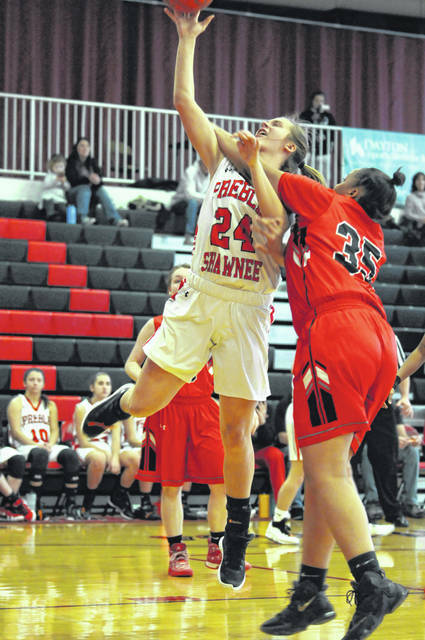 Hollon scored seven points to help Shawnee to a 68-25 win.